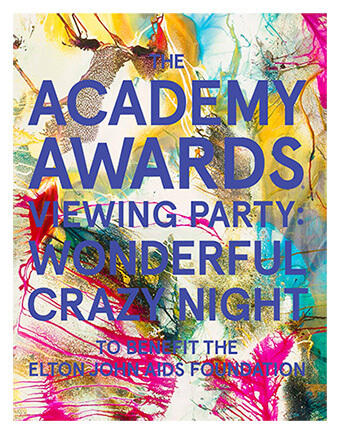 LOS ANGELES, Jan. 20, 2016 — The Elton John AIDS Foundation (EJAF) will present its 24th annual Academy Awards Viewing Party Wonderful Crazy Night on Sunday, February 28, 2016, at West Hollywood Park in Los Angeles. Elton John and David Furnish will host the gala event. The Foundation is profoundly grateful to its Presenting Sponsors BVLGARI, M∙A∙C Cosmetics, and Neuro Drinks and Diana Jenkins for supporting this important event so generously. This year’s event co-chairs are Tim and Jane Allen, Beck, Boy George, Naomi Campbell, Jim Carrey, Ciara, Chris Colfer, Ellen DeGeneres and Portia de Rossi, John Demsey, Zooey Deschanel, Jennifer Kelly Dominiquini, Roland Emmerich, Stéphane Gerschel,Neil Patrick Harris and David Burtka, Debbie Harry, Stephanie Horbaczewski, Samuel L. Jackson, Diana Jenkins, Caitlyn Jenner,Quincy Jones, Nicole Kidman and Keith Urban, Billie Jean King and Ilana Kloss, Heidi Klum, Ryan Kwanten, Fred Latsko, Shelley Lazar, Sandra Lee, Rob and Sheryl Lowe, Eric and Janet McCormack, Joe McMillan, Lea Michele, Matthew Morrison, Sharon and Ozzy Osbourne, Katy Perry, Tyler Perry, Adam Press, Andrew Rannells, Smokey and Frances Robinson, Zoe Saldana, Steve Sims,Britney Spears, Sharon Stone, Jeffrey Tambor, Steven Tyler, Denzel and Pauletta Washington, and Allison Williams. ELTON JOHN AIDS FOUNDATION – At EJAF, we believe that AIDS can be beaten. We act on that belief by raising funds for evidence-based programs and policies, and also by speaking out with honesty and compassion about the realities of people’s lives.Elton John created EJAF over twenty years ago, first in the United States in 1992 and then in the United Kingdom in 1993. Through hard work and with the help of our network of kind and generous friends and supporters, the two foundations together have raised more than $349 million over the past two decades to combat stigma, prevent infections, provide treatment and services, and motivate governments to end AIDS. The U.S. foundation focuses its efforts on programs in the United States, the Americas, and theCaribbean, while the U.K. foundation funds HIV-related work in Europe, Asia, and Africa. Join us in speaking out, taking action, and contributing to our efforts to achieve a world without AIDS. For more information, please visit www.ejaf.org. BVLGARI – Bulgari is a name emblematic of Italian excellence. Emboldened by 2,700 years of Roman history, Bulgari honors its rich past with modern designs. Known for stylistic audacity and a penchant for color, Bulgari pieces are immediately recognizable. Designing with the sensuality of volume, a love of linearity and a reverence for the art and architecture of Bulgari’s Greek and Roman roots, these iconic features are found in each of Bulgari’s creations. Harmonized with Rome’s ancient history, Bulgari incorporates the city’s symbolism while innovating its design for the future. Classic yet contemporary, Bulgari upholds its 130-year legacy with a timeless sense of exquisite beauty. Originating in Rome, Bulgari was founded as a jewelry shop in 1884 by Greek silversmith Sotirio Bulgari. With passionate skill and vision, he set the stage for Bulgari to become a permanent emblem of Italian excellence. For the 130 years thereafter, Bulgari’s ceaseless creativity, formidable history of innovation and a bold pioneering spirit led the jewelry House to become a legend. Bulgari is a name that has become synonymous with artisanal craftsmanship, avant-garde materials and unrivalled design. The Eternal City’s architectural beauty has long inspired the Italian jeweler: Bulgari reinterprets the majestic symbols of Rome with extraordinary editions of jewelry, watches, accessories and perfumes. For more information, please visit www.bulgari.com. M∙A∙C COSMETICS – M·A·C is the world’s leading professional makeup authority because of our unrivalled expertise in makeup ARTISTRY. M·A·C celebrates diversity and INDIVIDUALITY – we are for All Ages, All Races, All Sexes. M·A·C is a proud COMMUNITY of professional makeup artists working together to bring our vision to life. M·A·C is at the forefront of fashion TRENDSETTING, collaborating with leading talents from fashion, art and popular culture. Our Artists create trends backstage at fashion weeks around the world. M·A·C believes in SOCIAL RESPONSIBILITY, with initiatives such as VIVA GLAM and the M·A·C AIDS Fund at the heart and soul of our unique culture. One hundred percent of the selling price of VIVA GLAM lip products goes to the M·A·C AIDS Fund, which helps people affected by HIV/AIDS globally. With the support of spokespeople like Miley Cyrus, Nicki Minaj, Rihanna, Lady Gaga, and most recently, Ariana Grande, the M·A·C AIDS Fund has raised more than $400 million exclusively through the sales of VIVA GLAM lip products. Part of the Estée Lauder Companies since 1994, M·A·C is sold today in over 107 countries around the world. It remains committed to developing new categories, products and over 70 collections each year, all of which continue to serve the demand of consumers and professional makeup artists alike. For more information, please visit www.maccosmetics.com. NEURO DRINKS – is the revolutionary line of Functional Beverages with the goal of offering healthy beverages that benefit body and mind. Bottled proudly in California and New York with the purest of ingredients, Neuro Drinks are Vegan, Gluten Free, and have no artificial colors or flavors. Each Neuro Bottle is BPA Free and 100% recyclable, while every Neuro Drink contains a low calorie count of 35 calories per bottle. Neuro SONIC is a healthy and superiorly refreshing alternative to the standard energy drink, combining optimal doses of green tea derived from natural caffeine, and superfruit extracts of pomegranate, acai, and blueberry. Neuro DAILY is your own private body guard that offers you daily health with 1000 IU of Vitamin D, pure Organic Aloe Vera from volcanic rich soil, as well as selenium and zinc. Neuro BLISS is clinically studied to reduce stress and cortisol levels. It is built from a blend of high quality ingredients provided at peak levels to destress and calm your mind. Neuro SLEEP helps with the one thing we all love and don’t get enough of: calm, restful sleep. A full serving of melatonin and magnesium work together in Neuro SLEEP to bring you a delicious, dormant, and dreamful night. To learn more visit www.drinkneuro.com. AMERICAN AIRLINES – American Airlines Group (NASDAQ: AAL) is the holding company for American Airlines. Together with regional partners operating as American Eagle, American offers an average of nearly 6,700 flights per day to nearly 350 destinations in more than 50 countries. American is a founding member of the oneworld alliance, whose members and members-elect serve nearly 1,000 destinations with 14,250 daily flights to 150 countries. This year, American Airlines Group Inc. topped Fortune Magazine’s list of best business turnarounds, and its stock joined the S&P 500 index. Connect with American on Twitter @AmericanAir and at www.facebook.com/AmericanAirlines.